The right mobile device for the job. The Glacier-Computer M3 Series utilize a revolutionary board-level ruggedization technique, providing an ultra slim, ultra durable form factor for fatigue free all day use. Please call one of our sales representatives to help with your specific configuration. Perfect for the medical And health care environments With an antimicrobial casing to WithstAnd repeated sterilizations InTel XScale PXA-270 624 MHz, 20 megapixel Camera, 1D or 2D scanning, Bluetooth And GPS Enabled Please call one of our sales representatives to help With your specific configuration. Interface Cables And Charging Cradle Sold Separately. Offers Windows Mobile. Intel XScale PXA-270 624 MHz, RFID 13.56 MHz, ISO 14443, ISO 15693, Bluetooth and GPS enabled. Please call one of our sales representatives to help with your specific configuration. 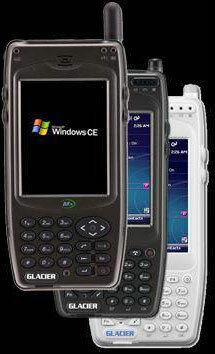 Multi-functional HAndheld Computer running Windows CE Internal And external antenna, Bluetooth, 1D Scanner Please call one of our sales representatives to help With your specific configuration. Interface Cables And Charging Cradle Sold Separately.